The Blue Cave is one of the most popular caves in Croatia, located in a small cove of Balun on Biševo, a little island in Central Dalmatia. This beautiful cove is specific due to its two holes: the first one is smaller and artificially deepened, so canoes can pass through it, but it has no influence on the illumination inside. The second one, located on the southern side below the sea, is like a vault and much wider, which allows the sunlight to pass through it. Around noon, if the sea is calm, the sunlight penetrates through that underwater hole, and reflects the water coming from the white bottom of the cave. Thus, the whole cave is illuminated with blue light, while the underwater objects appear to have silvery shine. 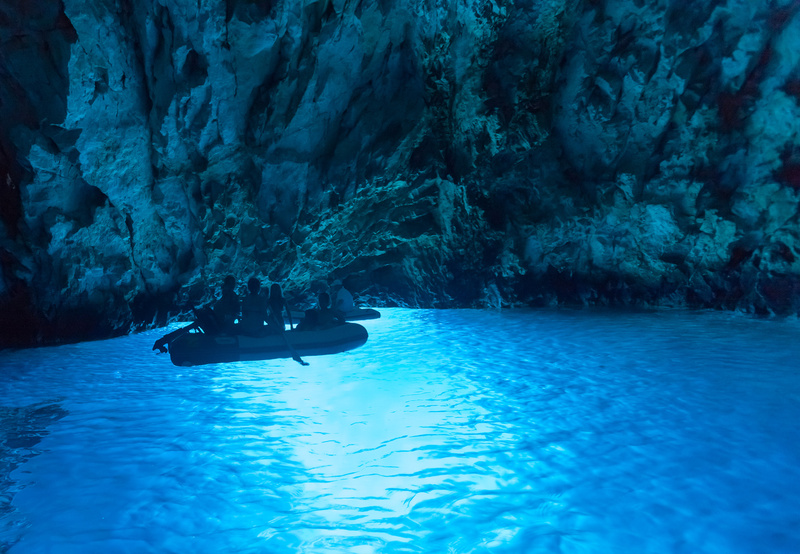 Because of this unique natural phenomenon, combined with the breathtaking visuals, the Blue Cave has become one of the most popular tourist attractions in the Adriatic. Interesting fact: The entrance to the Blue Cave was accessible only to divers until 1884, when baron Ransonet’s proposal was accepted, in which he advocated for building a man-made entrance that would be large enough for boats. On the southern side of the island of Vis, there is an uninhabited islet called Ravnik. On the south-western side of Ravnik, you will find the famous Green Cave. The sunrays pass through the crack on the cave’s ceiling, and shoot green colored reflections back and forth inside the cave. The cave got its name due to the emerald green reflection, resulting from an abundance of green algae on the bottom of the rocks, situated at the entrance of the cave. The Green Cave is a wonderful natural phenomenon, especially interesting to divers. Swimming is allowed in this cave, which we full heartily recommend. 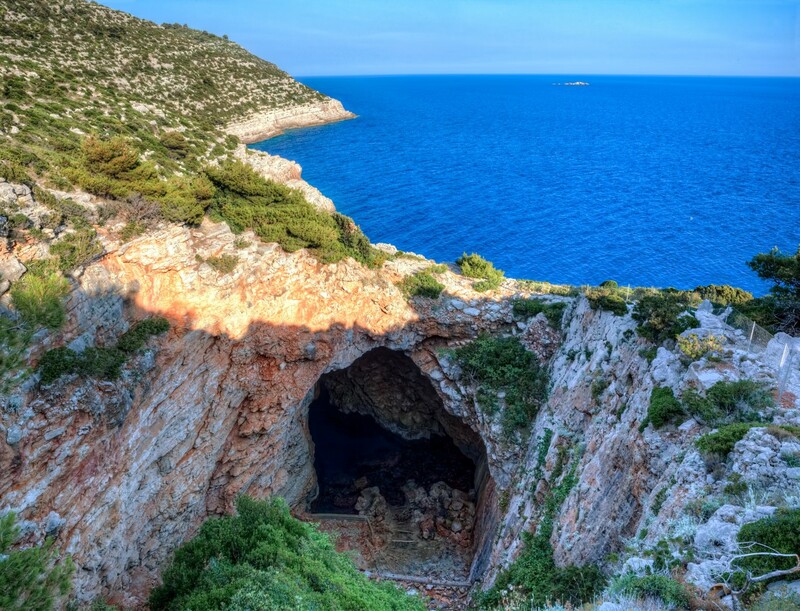 Interesting fact: During the World War II, a small warship found its shelter in this cave. The Odysseus Cave or Pit is a geomorphological phenomenon, located on the southern side of the island Mljet, in Babino Polje. It is an egg-shaped cave, whose ceiling had broken off, leaving it looking like a pit or a wide well. The Odysseus Cave is used today as a shelter for fishing boats and fishing tools, and it is the most unusual harbor in the Adriatic. During summer months, around noon, when the sun beams strike the cave area, the sea creates a spectrum of colors, fascinating to tourists and nature lovers. In front of the cave, there is a cliff called Ogiran. During the high tides and strong southern winds, the cliff is completely covered by the sea, and thus, represents a huge danger for sailors. According to the legend, Odysseus was shipwrecked on the rocks, but he managed to swim to the cave, where he took shelter. 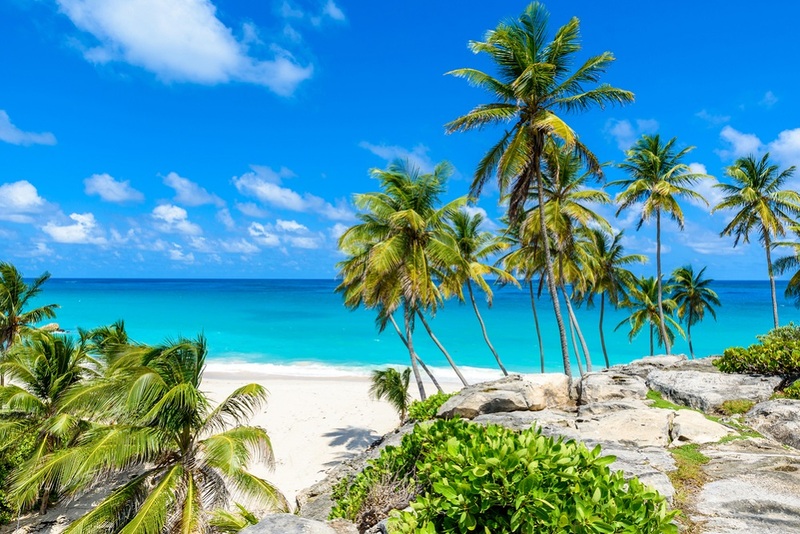 The island was ruled by the beautiful nymph Calypso. Odysseus was charmed by her and the beauty of Mljet Island, where he ended up being “trapped” for seven years before gods released him. Interesting fact: The Odysseus cave was once a natural habitat of the Mediterranean monk seal, one of the world’s most endangered marine mammals. Grapčeva Cave is located on the southern side of the island of Hvar, near the village of Humac and it represents the cradle of Hvar’s civilization and culture. This cave is the most important prehistoric finding of the New Stone Age (the Neolithic), and is one of the oldest discoveries in the Mediterranean. The cave consists of a small and a big hall, surrounded by hallways and smaller premises. Stalactites and stalagmites, which dominate the cave, make a magnificent and unforgettable sight, especially when illuminated by candles. The cave is accessible to tourists and the visit is organised by the “Humac” Association that takes care of the cave. Interesting fact: In 1964, Grapčeva Cave was declared a protected natural monument. 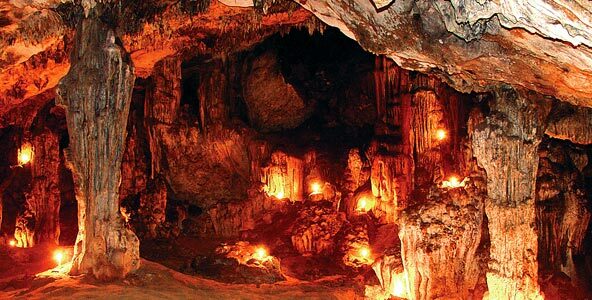 Biserujka Cave has become one of the most visited caves in Croatia in the last ten years. It is located 300 meters north-west from the village Rudine, in the municipality of Dobrinj, on the island of Krk. The cave is accessible to tourists, and what makes it so special is the richness of its decorations: the sumptuous stalactites, stalagmites and calcite columns. Besides the magnificent interior, the visitors are also intrigued by its interesting story, according to which pirate treasure is hidden somewhere in the cave. Biserujka Cave is located above Slivanjska bay, and they are both connected with an educational trail, so this way visitors can find out many interesting details about this landscape through five info panels. Interesting fact: There are six stenoendemic species living in Biserujka cave (the narrow endemics of the Kvarner area). 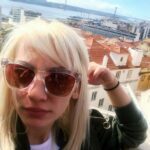 I'm an editorial assistant of the SailingEurope blog. I love writing as much as I love traveling, and I hope to see every corner of the world one day. I'm keen on learning about different cultures and people. I also love ice cream, dancing and sunsets at sea. 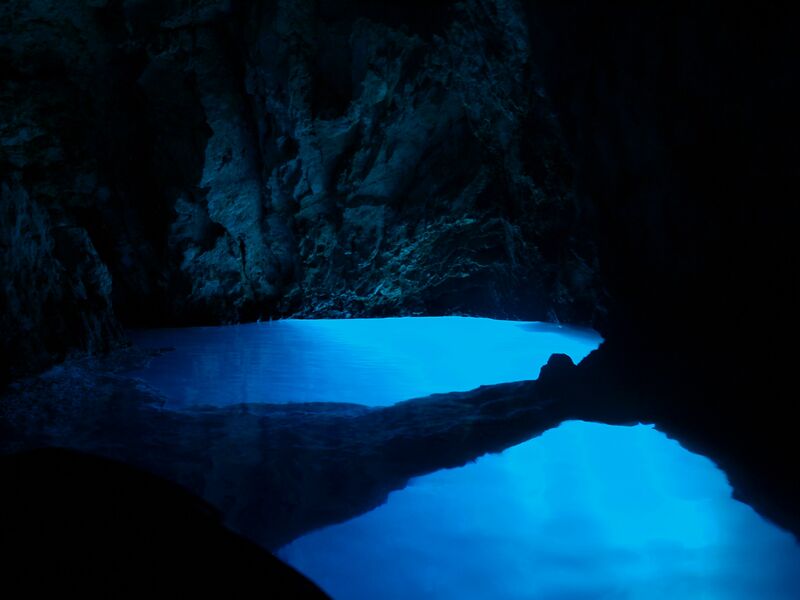 The Blue Cave I have heard this name these is that place where cave’s water is shining of blue color. I want to visit this place, I like your shared images. Can anyone guide me where is this place? 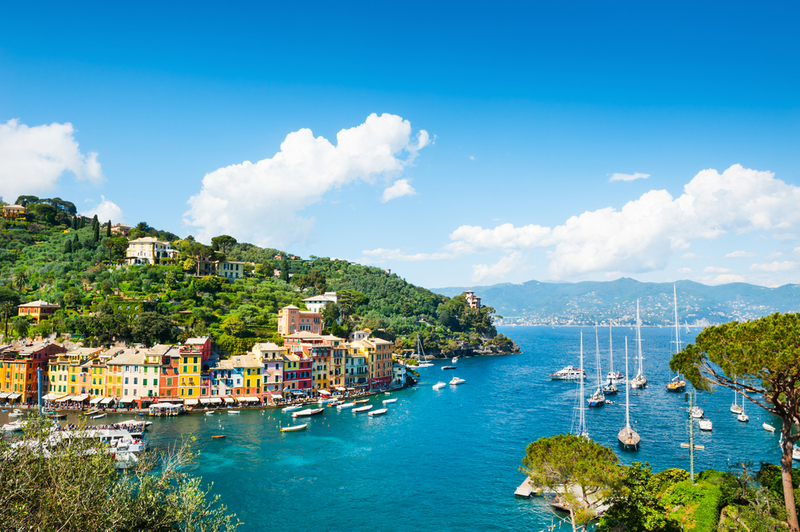 can I boating over there with my luxury superyacht charter south of France? Very Nice article, thanks for sharing this memorable experience with us.